If these symbols are displayed on products/items it means they can be recycled. These symbols may be on items which could be recyclable, but you need to check carefully. Remember “If in doubt leave it out”. These are irrelevant to whether you can recycle the product/item. We have detailed three other symbols which you might see on packaging, but they do not relate to whether you can recycle them. The Recycle Now icon is designed to be the recognised symbol for recycling and to motivate people into action. The curved arrow represents the action and sustainability of recycling. The heart signifies the feel-good nature of the recycling activity. The Recycle Now symbol is intended as a call to action symbol asking people to recycle whenever possible. The symbol is used in two ways, when appearing on packaging it is an indicator of the ability of different elements of the packaging to be recycled. This symbol is also used to indicate where recycling facilities are located. This symbol means the packaging is made from glass. Glass can be recycled in the household recycling bin in Sussex or in public bottle banks. Aluminium can be recycled in the household recycling bin in Sussex. This symbol means the packaging is made from steel. Steel can be recycled in the household recycling bin in Sussex. The crossed-out wheelie bin can be found on items such as batteries, electrical and electronic items, which are covered by the WEEE Directive. These can all be recycled at your local Household Waste Recycling Site. 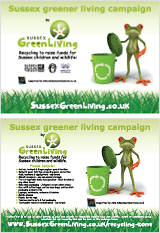 To find your nearest Household Waste Recycling Site go to Recycle for West Sussex. The Mobius Loop has no precise meaning. It is generally understood to be the international symbol for recycling, but the use of the symbol is entirely voluntary. It generally means the item can be recycled; however it will depend on the recycling facilities in the given area. There are 6 different types of plastic polymer commonly used to make packaging. The symbol used to identify the type of polymer is a triangle with a number inside it and some letters underneath. Unfortunately the triangle does not mean that the packaging can be recycled and the council recommends that residents ignore this symbol on packaging. A % indicates that a certain quantity of recycled material has been used in the production of the packaging. This is commonly found on cardboard. The Green Dot is a symbol used in many European countries. It shows that the producer of the packaging has made a financial contribution towards its recovery and recycling, in the country of origin or sale. This symbol has no relevance in the UK, and does not indicate that the item can be recycled locally. To be given the National Association of Paper Merchants mark, paper or board must be made from a minimum of 75% genuine waste paper and / or board fibre, no part of which should contain mill produced waste fibre. Dispose of the item carefully and thoughtfully. Do not litter. This doesn’t relate to recycling, but is a reminder to be a good citizen, disposing of the item in the most appropriate manner.